Got her at 8 weeks she is now 10 ..her and her brother Caeser are just amazing so far!! I will keep them up to date on pics as they get older... 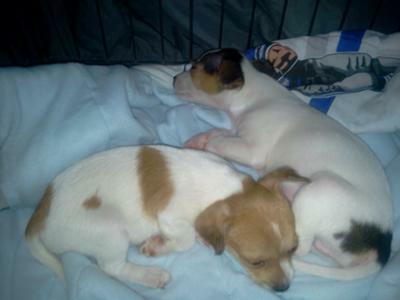 I love these adorobale Jack Russell Terrier Babies!!! Join in and write your own page! It's easy to do. How? Simply click here to return to Jack Russell Terrier Pictures Submissions.